When your baby cries, when you cry for sleep, when you're covered in poo, simply remember my favorite things and then you won't feel so blue! 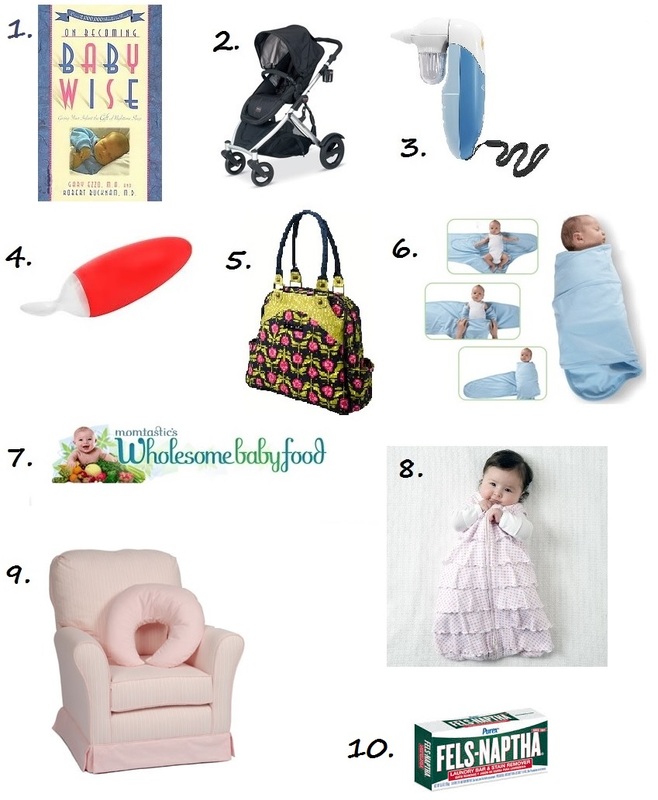 Ok... that's not really guaranteed, but here are some of my favorite baby things anyways. Just know, I like to keep things simple and inexpensive. I don't have a changing table (there are flat surfaces all over my house - mostly called floors!). I have a TON of hand-me-downs, and I love them (especially my crib and glider). But at the same time, there are a couple of things I splurged on because of how great I know they are! Some of them I've picked up from nannying for a thousand years and some of them were recommended to me when I was pregnant. Note: Please do not let the first item deter you from any of my opinions. I'm simply sharing with you MY favorite things. Sleep methods can be a hot topic amongst mommies and me being an avoider of confrontation would not like to get into it about sleep methods. I would, however, love to share with you what has worked for US. *Some items can be found for lower prices at consignment stores or online. These are prices for new items. So, my number 1 item is the book, On Becoming Baby Wise. There are many opinions on this book. I'll just have you know that I am an advocate. It has worked for us and we would have struggled without it. (Actually we did!) I would suggest both parents read it (my husband did not) so you are on the same page, though. In this house, we do not function without sleep. Well, more me than Jeff Nef, but nonetheless good sleep=happy family. It's a fact. No matter the sleep methods you choose. We chose sleep training for Paisley so she could learn to self-sooth and sleep independently. We put her in bed, awake, for all naps and nighttime sleep. If she cries it is usually for a very short period of time (I literally just timed her and it was under 10 seconds) and then she wakes up ready to go - no memory of the prior crying. At night she's down anywhere from 11 to 12 hours - usually 8 to 8. Right now, at 10 months old she is still taking 3 naps. The first two are about 1 1/2 to 2 hours long and the third is anywhere from 20-60 mins (last night it was an hour and 20 mins!) This did not come easy and there were many nights where I cried with her, but I will say it was/is well worth it. Sleep is like gold to me and the gift of good sleep keeps us from killing each other. A major idea of this book is teaching your baby to keep eating and sleeping as two separate activities entirely. This entails keeping them awake for FULL feedings and not letting them fall asleep while they eat. This is extremely hard to do for the first few months. While trying this, I read another book, Healthy Sleep Habits, Happy Child, and really liked some of it's principles, too. For about two weeks after I read it I gave up the Baby Wise guideline of not letting them fall asleep while eating. That was the worst two weeks I've had with Paisley. She was fussy all of the time for what seemed like no reason. She wasn't eating well and her naps were shorter. As soon as I got back to the stability of Baby Wise she was back to her happy, seemingly easy self, she took full feedings, and her naps became longer stretches. I can't tell you enough how this book has worked for us. My favorite line is "Sleep begets sleep." Basically the more the baby sleeps, the more he/she will sleep. I had been believing the myth that you needed to keep them up so they would sleep better at night! It's false. Her last nap can be as late as 6pm sometimes and she'll only be up from 7 to 8, but she's ready for bed and sleeps through the night. Sorry... I could talk about Baby Wise for days, but I'll stop boring you! If you have any questions about it please feel free to ask! Number 2 is a travel system. I just pictured a Britax one because that is what we have. I can't really speak for the greatness of others, but I do recommend having a travel system or at least a snap and go stroller. This was our big splurge. They really come in handy while your baby is still in their baby carseat. It's a lot of work getting them in and out on errands (and a nap ruiner) when instead you can simply unsnap the carseat, snap it into the stoller, and go. Our Britax stroller has been wonderful. It's pretty easy to open and close and I can even lift it into the car with Paisley in my arms. This stroller is such a smooth ride and the larger wheels make it easy to push anywhere... I haven't tried the beach yet, but what stroller is great on the sand? FYI the carseat comes with the adapters to make it snap into the stroller and the stroller seat can face forwards or backwards! That was one of my favorite features - forcing Paisley to stare at my face. That's one of the biggest reasons I don't use them. This nasal aspirator by Graco is electric. My sister first showed it to me and I thought it might be a little too intense for a baby, but it's not. I've tried it myself. Very gentle. :) When you first get home from the hospital they still have a lot of mucus that will continuously expel itself through coughing, sneezing, ect. Their mouth and nose need to be sucked out often. This really helped! I feel like it got out a lot more mucus than the bulb ones without irritating her as much. I love this thing! It also has a little button to play music while you're sucking snot... Note: the music has probably never helped to calm any baby who had something shoved up their nose. Number 4. THE SQUIRT by Boon!! I got questions about this little gem all of the time! All you do is pour any baby food of your choice into the handle, then squeeze, and feed! It is so much cheaper to use than buying expensive pouches of baby food. It eliminates the mess and fuss of feeding baby on the run. Sometimes I've used it at home, as well. You can totally feed your baby while you eat, too! Note: When I received this at a baby shower, a guest commented that it was for lazy parenting. I beg to differ: Genius parenting. Genius. Number 5 was another splurge! This is a Petunia Pickle Bottom. Only my favorite brand of trendy diaper bags. Here's the thing. You don't need a Petunia, but you do need something to double as a purse. Well, that's my theory. I like to keep it simple, remember? Find a bag that you won't mind toting everywhere and that you can fit your wallet into along with your baby needs. I am the kind of girl who only keeps the essentials in her diaper bag - diapers, wipes, a change of clothes, nursing cover, 2 toys, baby food jars with treats. Now my sister, on the other hand, has everything short of a hammer and nails. I just can't handle that much bag. So it's up to you, but I do love a Petunia! Number 6 - I have to say, I was a skeptic. I did not believe in the magic of the Miracle Blanket. Jeff's siblings swore by it! They said all of their babies slept better because of it (I believe ours slept better because of the sleep training), but in the end I was won over. At first, it was very tedious to wrap Paisley in this infant straight jacket every night, but then I became more efficient and she did seem to sleep better. She even got to where she would see and immediately relax and wait to be swaddled. She loved to be swaddled and this was the only one she couldn't kick her giant feet out of (notice the patented foot pouch). Anyways, after using the Miracle Blanket, I wouldn't swaddle with anything else (Aiden and Anais blankets were the worst actually... big let down because they're so cute. The swaddles with Velcro didn't work nearly as well as this either). Number 8 Sleep Sack! This is the next step after swaddling. You don't want to put your infant to bed with a blanket. Besides not actually keeping them warm because they are not stiff wooden boards that don't move, they can also be a suffocation hazard. In comes the sleep sack. It's basically the infant Snuggie with a zipper (the zipper goes down instead of up so they don't scratch their faces - yes, they've thought of everything! I know!). There are multiple styles and even one for swaddling - I haven't tried it yet. This just alleviates one of the many sleep worries for me. I seriously can't get enough of the sleep sack! Number 9 Any rocker/glider and nursing pillow. I think the power of a good rocker is underestimated. Having been without one for many months, I can attest. It changed my life when I finally got one. That's where we have our best snuggles and precious moments. It also keeps my back from breaking while holding a giant baby. The nursing pillow does the same. My back KILLED when I didn't have one. The nursing pillows also come in handy for bottle feeding and laying on the floor! Please don't be a reckless nurser and consider using one. Number 10 Nepfelspar. Fels Napth. Napfelspa. Fels-Naptha! I could not get this name right... Truth be told, I just learned the correct name yesterday! I've had this bar for months before Paisley was born and I'm just now learning the name - a year later. A considerate friend gifted this to me and told me how important it was. I didn't believe her until... THE EXPLOSIVE POOPS BEGAN! This magical bar of sunshine can eliminate any poop stain dragging down your day! You have to try it! Seriously when you get poop on your own clothes that's when it gets real and you better have some Fels-Naptha on hand. You'll be glad you did. Note: after it sets for a few minutes go ahead and wash it. Do not let it sit until you have a full load. It works best soon after scrubbing. Well, their you have it. Some of my favorite things! I could go on: a swing, Baby Sign Language (seriously try it. Soooooo stinking cute! ), tiny ponytail holders. But we'll save those for another day. Well maybe you can use these one day... soon! Ha just trying to start rumors! let me know when you get older kids figured out - how to get them to stop fighting, whining, talking back, being lazy, and basically being the most annoying people on the planet. We eat. We lounge. We laugh.